My New Addiction, Why Didn’t Someone Warn Me?! When was the last time you did a puzzle? I think I was probably 10 years old, maybe younger. Recently I shared some of the whimsical artwork of Charles Wysocki, a talented artist I just recently discovered. 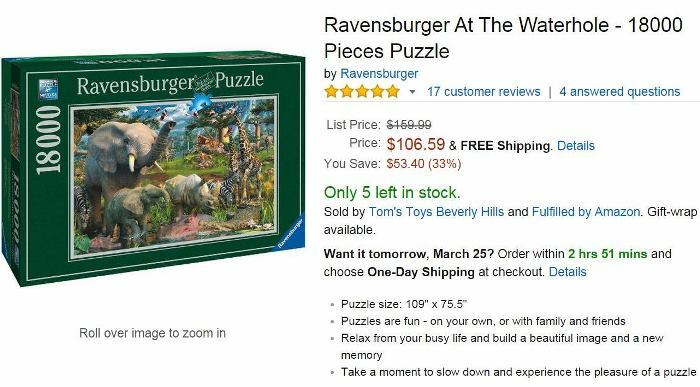 While visiting the online store his family maintains since his passing a few years ago, I discovered several of his paintings had been turned into puzzles. I thought to myself, “That’s nice.” That’s where my interest ended. Then I discovered a painting he had done called Small Town Christmas. The detail is so amazing with 7 birdhouses, multiple birds including an owl, darling shops with adorable signs, an elf in the tree, a dog, a cat, pheasant and so many more charming characters. I noticed it came in puzzle form and thought it might be fun to do, so I ordered it. What a can of worms I have opened! Addicting! Why didn’t anyone warn me that doing puzzles can be addictive! lol If you enjoy doing puzzles, you probably know what I’m talking about. Maybe it’s my love for organizing but I find it very difficult to stop once I start working on it. I find myself saying, “Just one more piece and then I’ll stop.” Placing each piece and watching this 1,000-piece puzzle come to life is like 1,000 mini-successes, 1,000 little celebrations. I worked on Small Town Christmas this weekend and here’s how far I got. I think one more session and it will be complete. The puzzle came with a mini-poster to use as a guide. Puzzle-doing is probably more of a winter time activity or one to do in the evening while watching TV or listening to a great book on Audible. It’s too pretty out right now, plus the garden awaits. You know how sometimes you start a new hobby and suddenly you discover there are millions of people already doing it, a huge community of knitters, crocheters, bikers, gardeners, etc…who have been enjoying your new-found hobby for many years? Ordering this Charles Wysocki puzzle has opened a whole new world that I never knew existed. Apparently, I’m not the only one who enjoys puzzles because there are over 42,000, one-thousand-piece puzzles on eBay alone, and that’s just the 1,000-piece size! One site I looked at had a puzzle that was 18,000 pieces! Where would you even assemble a puzzle that size, maybe on the floor of a basement or garage? It would have to be in a really big room because the finished puzzle is over 9 ft x 6 ft! Just for grins I checked to see how much the most expensive 1,000-piece puzzle is on eBay. For just $1,315.86 you can have a one of a kind leaf-shaped puzzle that the ad says you “won’t find in Wal-Mart.” I had no idea puzzles were such big business! On Sunday I was thinking, there has to be a better way, there has to be a better way to do a puzzle than hanging over it dying in agony from neck and back pain. I envisioned some kind of tilt board that would let one put a puzzle together without leaning over it. I Googled various phrases and was excited to find, there is! Before I share the one I found and ordered, here are a few I saw that I thought were interesting. Did you know you can roll up a puzzle that’s in progress to store it away when you’re done working on it. This let’s you do a puzzle on a dining table or coffee table, then clear the table when it’s needed for dinner or some other purpose. Who knew?! There are also “Puzzle Boards” that come in various sizes, again providing a surface on which to do the puzzle and put it away when needed. This one came with sorting trays which is a great way to sort through pieces without losing them. The one I liked best though is this one. It’s an adjustable board that can be tilted to various heights. It has a felt background so the pieces won’t slide. Genius! It’s available here: Tilt Table-top Puzzle Board. Update: I purchased this puzzle board and love it! It takes all the strain off your back, no more bending over to do my puzzles. 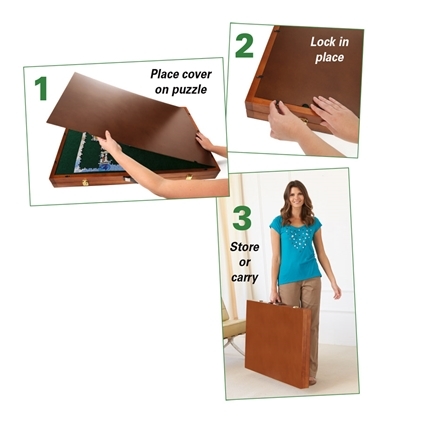 It also folds down for storage with the unfinished puzzle inside and can fit under a bed, sofa or behind a door. It’s designed to fit most 1,000-piece puzzles, which is as big as I would ever have any interest in doing. Yep, they’ll be no 18,000-piece puzzle parties going on here! This puzzle business is huge. HUGE! There is a beautiful puzzle out there for every interest, hobby or love. 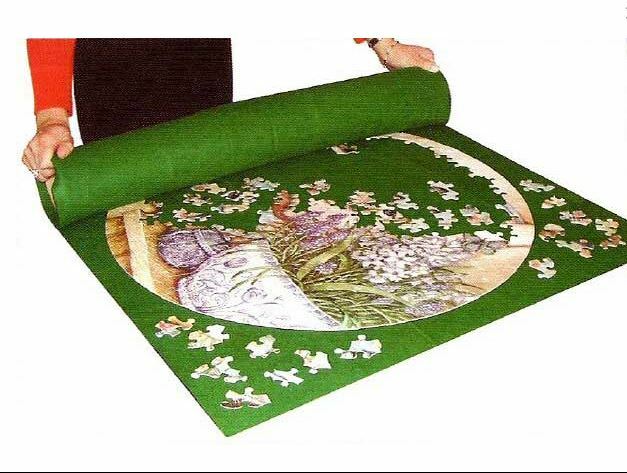 There are cat and dog puzzles, gardening puzzles, travel puzzles, art puzzles, book puzzles, etc. You name it, there’s a puzzle of it somewhere. I bet if I looked, there’s probably even a china or dish puzzle! My new puzzle board is supposed to arrive on Thursday and I have no puzzle for it. So last night I spent some time looking at what’s out there and fell for this one. 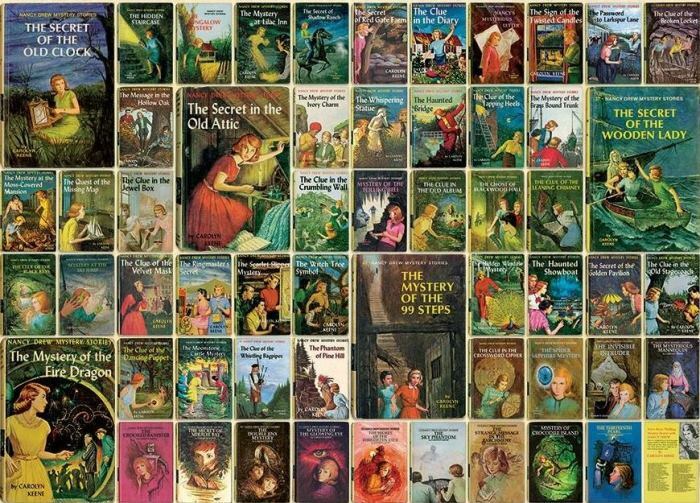 Nancy Drew books will always have a big place in my heart, they were my favorite books growing up. So, I have to do this one out of nostalgia. Update: Several folks have asked where they can find the Nancy Drew puzzle. I purchased mine here: Nancy Drew Puzzle. Did you know some folks frame puzzles once they are done? Another new thing I learned in the world of puzzles! I think I may have to frame the Nancy Drew puzzle, we’ll see how it looks when complete. Any puzzle fans out there? If so, what brand is your favorite? Do you frame them once they’re completed, give them away for others to enjoy or save them to put together another day? Puzzles can be seriously addictive. I think it is a great work to exercise ones brain (pattern recognition). You can also find free online puzzles to work. Lots of fun and just as addictive. You can’t frame an online puzzle, though. Rats! Oh, didn’t know about that! Thanks, Nancy! I framed a completed puzzle many years ago when first married. It was a sentimental puzzle, and hey, we needed art work. My mom loved to work on puzzles and kept one going at her home and later in her retirement apartment. I love to sit and work on a puzzle. It’s good problem solving for the brain! I kept an ongoing puzzle table for my students when I taught. There were those who loved to go work on the puzzle and then those who never chose that activity. Thanks for sharing your puzzle finds. Have fun! Oh, I love that Sarah. Do you still have it? I love the idea of keeping one going at all times so family members can work on it anytime they like. Wish I had thought of that when Chip was growing up. Such a great idea! Hi, Susan – I share your enthusiasm for puzzles and have found a particular artist and puzzle company that I really love. The puzzles are by Artifact and they are made of all wood pieces that are very intricately laser cut into the most amazing shapes. Many of the shapes echo the theme of the puzzle. Artifact’s puzzles are available at Amazon and are not inexpensive. For Christmas, I was given Kevin Sloan’s “The Burden of Formality” by Artifact. Wow! What a challenge! There are no straight edges to this puzzle. I love the painting. It’s sort of a whimsical nod to Audubon. I made it as far as assembling the stack of teacups and then had to put it away so that I could use my dining room table to actually eat off of instead of using it for my puzzle. I have since begun to follow Kevin Sloan on Facebook and really enjoy his artwork. Hope you will take a look at Artifact. They really have some amazing puzzles! Melinda, thanks for telling me about Artifact. No straight edges, sounds fun and definitely a challenge. Will check those out for sure! 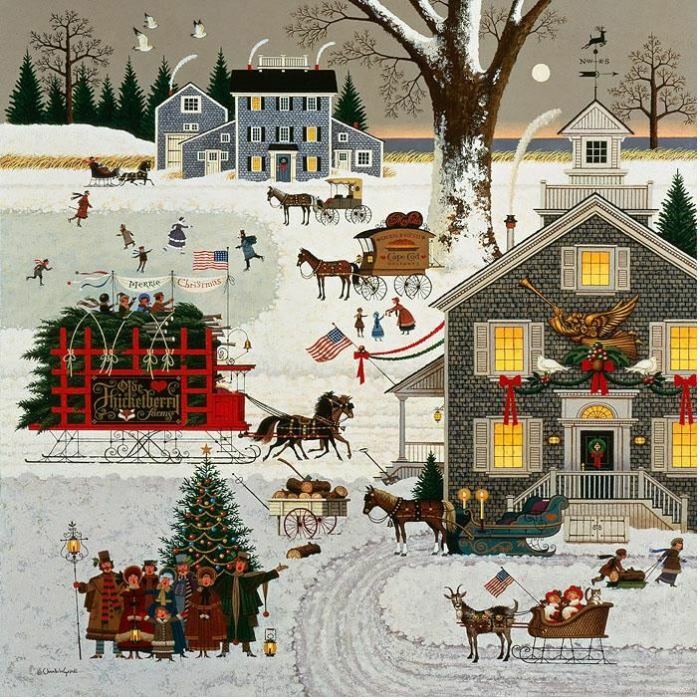 When you posted “The Whimsical Art of Charles Wysocki , I mentioned that at one time we had the ‘Cape Cod Christmas’ puzzle. We love to do puzzles and keep one going often. I had not seen the storing roll-up idea…Wish I had known about it earlier! I like his Cape Cod Christmas, too! That’s one thing I’m discovering. I have to REALLY like the subject/picture to put the time into doing it. My husband of over 40 years and I have a tradition of giving each other a puzzle for Christmas. Yes, that is a large puzzle collection but we do give them away (some) once they’ve been built. Addictive – correct. Did you know you can build puzzles online? Yes, there’s an app for that! I didn’t know that! Interesting! I love puzzles and have started many people on the trail. We had an on going puzzle table at the last library I worked. People would stay for hours and relax. I find my puzzles at Goodwill for less than a dollar. Did you know that there are 3 D puzzles? I’m working on the Titanic at this moment. Use Mod Podge on them and they made great placemats! My grandmother, Mama Carlisle, loved working puzzles. Once her last child was grown and out of the house, my grandmother started staying with her other kids and spent a lot of time with my mom and me as my father worked overseas a lot. As soon as she would arrive, a card table was set up in the living room, a puzzle was dumped on it, and there would be a puzzle to put together until the day she left. We all would work on it for a few minutes, go do something around the house then come back and work on it for a few minutes more. I have not worked on a puzzle in years but now you have me interested in getting one!!! Like I really need something else in my life to do!!!!! lol I love the Nancy Drew puzzle. You really need to frame it. Susan, I’ll admit I’m addicted. Start my day with http://thejigsawpuzzles.com/ so much easier than having one on a table and use my comfy computer chair so my back isn’t strained. Give it a try. You’ll love it. Susan, a great addiction. I enjoy a puzzle on line in the evening to relax and clear my head before bed. Kathy, I love the wedding puzzles! I wish I had known about this when my son was getting married…such a wonderful, sweet idea! I use to but, it has been a long time.I use to do scenes and put some kind of glue stuff on them and frame them,i had three . 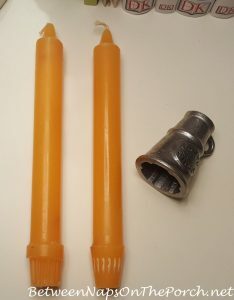 I got rid of them in a garage sale and haven’t done much since.They are fun and addicting but good for the mind i think. I always have a jigsaw puzzle going. And it’s always season/color/decor specific. Have I mentioned I’m an addicted obsessive? lol I think I am now! Hi Susan, What a great post. I share your new found addiction to puzzles. My Sister got me re-hooked post childhood when I was visiting her out in CA. She watched/listened to her tv when she was working on her puzzle, and if one of her three grandkids wanted to come over, she always welcomed them, but they had to work on the puzzle with her. Good for her! There is more than one skill to be learned from puzzles, not to mention the art of conversation. I keep a puzzle in progress on my kitchen table, but like you, have found it is painful for the ol’ back and neck. I am very, very interested in hearing how your slant-board works out. Also, I am very impressed with how much progress you made on your puzzle just over the weekend. This may be the latest diet craze as one can become so engrossed, we forget/forgo all common sense and normal routines. Thanks for all the links and suggestions. I will be checking them out. I hope one day I live close enough to do them with my grandchildren. If I ever do, I’ll have to make sure I always have one set up when they visit. Love that idea! Yeah, I worked on for much of the weekend. I couldn’t stop…I was under its spell. 😉 It’s funny, when I started, I was trying to remember how to do them. I don’t know how most folks do them but I did what I’ve always done which is separate out all the edge pieces and build that first. It took me a while to realize I needed to separate them out by color, too. It’s amazing what you forget when you haven’t done one in a hundred years! I have been doing Wysocki puzzles for years, and I have note cards, calendars, etc. Love his work. I love that most (maybe all) of his puzzles have an American flag in them. When our family of nine gets together for Christmas there is always a puzzle table set up inviting any & all to participate. The puzzle usually gets finished rather quickly that way. There’s one very special puzzle that our children assembled when they were very young – a beautiful, nostalgic Santa. We did have that one framed & every year it comes out at Christmas. Oh, I love that! What a lovely way to decorate for the season! I love doing puzzles! yes they are for winter weather or a rainy day. I’ve never seen the Nancy Drew puzzle, I’m going to have to go out and get that. I also grew up on her books, the first mysteries I ever read. I love puzzles. Growing up my Mom and I did a lot of them together. They were always set up on the dining room table with an old cloth underneath so we could roll it up out of the way. Some were quite challenging. Enjoy your new puzzle and fancy tilted holder. Let us know how you make out. Patty, she was ahead of her time rolling them up. Such a great idea! I’ll let you know. I’m looking forward to taking it for a spin. I think it will arrive before my puzzle does, though. I loved reading about your new found hobby, addiction. I fell in love with Wysocki prints many years ago when we built our first home. There were Wysocki calendars from Lang Co. and I framed many of them. I’m sorry now that I sold them when we downsized to a smaller home. But I’m sure someone else is enjoying them just as you are. Looks like it can be purchased here: I like that one a lot. Oh, never mind…it says discontinued. May have to look on eBay. I love doing puzzles. It is like a workout for your brain cells as they age. I found ‘the world’s smallest puzzles’ by Bonnie White on a clearance table at a fabric store a couple yrs. ago. Thought this might be fun…..and I was soon addicted to these puzzles. They come in nice little tins and some of them have the mini poster inside so you can see the puzzle more clear. The puzzles are landscape pictures that she has painted. I have done all of the mini’s and I so wish someone would make more of them. I noticed some of them have risen in price but I got them at a normal price. Maybe I will hang on to them. Love, Love, Love puzzles and you chose a good one. I have to time mine perfectly. When you have six little grandchildren under the age of 5 with sticky little fingers and droolly little mouths you can’t have puzzles on the card table in the middle of the living room. You end up with missing pieces and that will drive you CRAZY! But, it is a fun addiction for winter or a weekend alone. I just ordered from Herrschnners, husband’s Christmas present for next year. He loves to do the White Mountains Co puzzles, yankee magazine covers, fav candy coffee cans. They are like little puzzles in themselves, easier than ” is that an eye or a pond” The Fox collection does not appear to ship to USA, at least their site says NZ and AU. Wysocki’s puzzles are great too, have done plenty of them we pass on to family members when done, has anyone ever done a puzzle twice? The timing of this post is so fortuitous! The husband and I are planning a new getaway place, and I have decreed that there will be no work there, only play. I suggested that we take the games table stashed in the attic, various games we have already, and buy some puzzles. Both of us enjoyed them as children. When we visit Fairhope, AL, we always pass a store downtown (not sure which one) which has a table set up outside on the sidewalk with a big puzzle on it, an invitation to passersby to stop and help to solve. I had noticed that they were getting more expensive, but I had no idea that they could be over a thousand dollars! As I was reading, I kept thinking, “My drawing table which tilts — that would be ideal!” Then I got down to the bottom and there was a table which tilts. All I need to do, looks like, is to add some felt to the tabletop! I think I would want to save one of these big complicated ones when it is done and frame it, so next you will have to tell us how to pick it up and transfer it to a frame. By all means, you should save the Nancy Drew. Puzzles are a family event in our house. One Christmas I gave each of the children a nutcracker, decorated the tree with them and took them to see “The Nutcracker”. That year, the puzzle was also a nutcracker and they had all weekend to finish it before we opened the presents on Christmas Day. The tradition lives on, different every year. We ALWAYS take puzzles with us when we vacation in Hilton Head, maybe ending up doing 2 or 3, always working on the dining room table and covering the puzzle with a tablecloth when we heat dinner. Yep, they are addictive. Susan, I’ve never been a puzzler before but about a year ago I started playing them online. You can choose the cut (shape) and how many pieces the picture is broken in to. That way if you just have a few minutes, you can choose to do an easier version of the puzzle. When I read your Charles Wysocki post, I got excited about buying some real puzzles and rushed over to ebay and Amazon. It is so hard to choose! But I wound up not buying because I have umpteen projects I’m working on already! 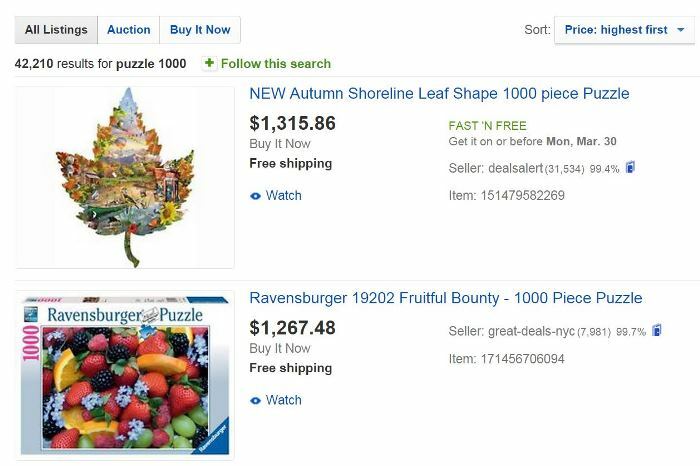 I do love that leaf puzzle, but yikes, $1,300 dollars for it? Who would pay that? Love this post! Last Christmas, I made my own felt-covered, heavy-duty cardboard board to “puzzle on” and would carefully carry it and put it away (usually on top of washer or dryer) when company would come. Sometimes the result was not so good. 🙂 I must order this! Where did you find the Nancy Drew puzzle? I credit Nancy Drew with my love of reading today and would love to get that. My 2nd post of today, but I just had to come back to see some more great suggestions and recommendations for us puzzle junkies. Susan, have you heard of a product called Glue Dots? The variety they make which is called “removable” would have been a great solution to the top pieces of your puzzle falling off your posterboard whenever it got bumped. I use the removable Glue Dots (Michael’s or Hobby Lobby, or online, green & white box) when I make greeting cards. It’s a great way to keep something in place temporarily. These Glue Dots come in a box, and are on a roll, so it would be easy to fit a dot onto the back of your top puzzle pieces, and then stick it down to your posterboard. This kind of glue is similar to the kind that holds junk mail credit cards onto the paper. When you don’t need it anymore, just rub it off the surface with your fingertip. I could feel your frustration with puzzle pieces falling overboard, so I just wanted to send this suggestion along. Susan, I love that Nancy Drew puzzle! I read Nancy Drew books growing up as well. I wanted to say that as long as I have been following you, this was the first post where I have ever seen you mention anything about your childhood. You might have said something about it in the first days of your blogging and I missed it. I don’t even think I know where you grew up? Growing up we did puzzles in our home, but I really got going with them when I was 12 and met my soon to be life-long friend who kept a table set up in her basement where we spent winter days doing puzzles while listening to 45 rpm records and eating lots of junk food…such fun! I haven’t done a puzzle in years, but you’ve enticed me. YES!!! My family has worked puzzles since before I was born 56 years ago. My parents have a puzzle out continuously and anyone who comes to the house is invited to “work puzzle”. We only work Springbok 1000 piece exclusively, they are the best for staying together and having the best shapes, thickness and size pieces. Many years ago my Daddy built Mama a special board for working puzzles and we still use it today because it stays out on a special table year round. If she has a lot of people at the house she just slides the board under the sofa and it’s protected until she’s ready to bring it out. We tear the puzzle up the minute we complete it, put all the pieces back in the box and write the completion date on the back of the box, tape it up and store it in a special closet. It takes about 2-3 years to work our way through all of them, then we start over again. We can complete a 1000 piece Springbok puzzle in an average of 3-7 days. It’s addictive!! Welcome aboard!!! I’m not addicted but my parents and one sister are. And when my sons would spend a week with my parents every summer they also did some over the top puzzle together in the evenings or rainy days. Twice they were dimensional – one of the Chrysler Building, another of Eiffel Tower. 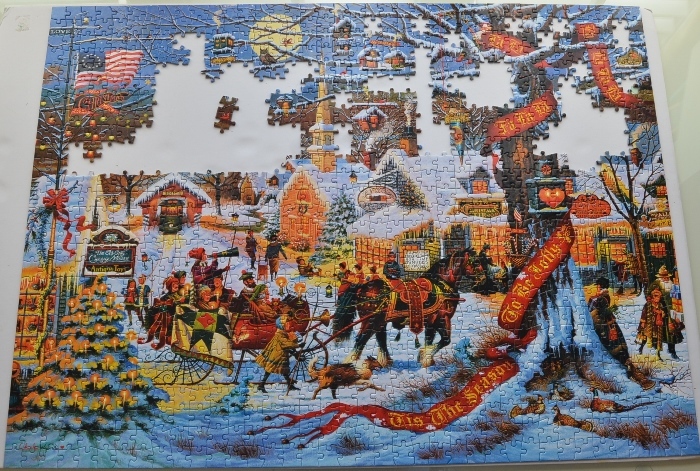 So, years ago, I started the tradition of buying a Christmas themed puzzle in the post holiday clearance sales. I’d also pick up a couple other non holiday themed ones. Then at Christmas time I bring the holiday puzzle out for three generations to work on around the table. I simple use a game board from Monopoly or whatever to move it out of the way – under a couch, chair or onto a coffee table. The other puzzles I mail to my parents as gifts during the year. Lightweight and unbreakable to mail. Oh and the finished Christmas puzzle, that I give to Goodwill each year. You’re too funny! I do puzzles in spurts…..being obsessed for a month and then nothing for years. I have a few unfinished ones under my bed gathering dust. I had a few Christmas “shaped” ones that I spray glued to some poster board, trimmed and hung up during the holidays. One had tiny Christmas lights and a battery pack. I’ve done several Charles Wysocki. If you like that style, try some Jane Wooster. I love all the detail in those. I prefer the 500 piece to the 1000 because I’m pretty impatient! I have never enjoyed doing puzzles. Not sure why but I get so frustrated and then give up. The thrill of the hunt is bot there for me:):) Love that tilted table!! Great idea. When we visited my grandmother in the nursing home they always had a puzzle going in the living room area and it was something we worked on with her. Conversations were difficult as her dementia got worse but she was perfectly content to sit with us and work on the puzzle, chatting a bit while we ‘puzzled’. You can have a puzzle made from a photograph. My daughter did that with a beautiful scenery photograph from their vacation. It was a little pricey, so she was not happy when their puppy chewed up one of the pieces before they had a chance to finish the puzzle. Stave puzzles and Liberty puzzles are wonderful works of art in themselves. 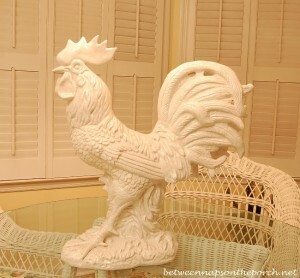 Both companies feature all-wood construction, and individual pieces of their puzzles come in various shapes, such as birds, animals, you name it. Many people frame their puzzles with glass on both sides so that you can see the interesting shapes of the pieces on the back of the puzzle. Challenging to put together, too. Enjoy your Nancy Drew puzzle. Think you might should frame the Christmas one, that would be very nice for The Christmas season for sure. Great post! I just sent it to my friend who does puzzles all the time. She just finished a big Downton Abbey puzzle, it is beautiful! Can’t wait to see you come up with a puzzle tablescape! LOL! Here’s a hint: when I was in Hobby Lobby Saturday, I saw some big unfinished wood puzzle pieces in their wood hobby section! Hmmm, what can you come up with for those, you are so creative, I’m sure something neat! I remember the good old days when puzzles were always being worked in my childhood home in the wintertime. Now I satisfy my craving by the puzzle app on my ipad!! I love puzzles but don’t have a place for them right now. My daughter and her hubby do lots of puzzles…they use the roll-up storage (700 sq ft apt) and they use some type of spread on adhesive to turn it into “frameable” art. Usually they frame it with 1/2 price poster frames…inexpensive art for newlyweds. The best Christmas gift my 2 children received from their Grandmary was a puzzle made from a picture taken of the two of them while visiting her. My daughter has that puzzle now. My grandparents always had a puzzle going on in their dining room! They had a very large family, so once all the kids were out of the house, it seemed silly to use the formal dining room for meals. Have you heard of a company that makes a product called ‘impuzzables’?? They make puzzles with ‘no edge’, as in, the borders are not straight sides, AND the puzzle is printed on both sides!! Crazy!! My uncle lived in a nursing home and he would put together puzzles so fast that we couldn’t keep him supplied. I gave him an impuzzable for Christmas once and it took him a month to put it together! Have loved Wysocki since finding his beautiful Americana calendars back in the ’80s. Saved them thinking, I’ll frame some of these – hasn’t happened but they are in my attic. They were great with older pre-schoolers and elem age kids who loved finding the details, sort of a Where’sWaldo game I did with them. I would like to have met the artist. Thanks for sharing his puzzle with us. I love doing puzzles, although it’s been a few years since I started one…maybe this summer. 🙂 I like that puzzles are something my husband and I enjoy doing together and we did one of the puzzles from that artist! I didn’t realize there were so many accessories for putting puzzles together, but the roll up bag is awesome! Thanks for sharing. I have my own puzzle addiction going – but it’s internet puzzle sites. I get a daily puzzle from JigZone. I also regularly visit TheJigsawPuzzles.com, jspuzzles, and others. Gotta love the internet…. Hi Susan! Oh, I love his artwork and I have to tell you a few years back I went crazy buying the puzzles and working them. I would hardly finish one and would have to go buy another! But..such delightful scenes. My little granddaughter who is just five, loves to work puzzles. She is up to 300 pieces if there is a great picture so she can see where the pieces go. I found a Wysocki for her and with a little help from me she finished it in an evening! Hope you’re doing well. Love them, its a family tradition to bring a puzzle to the beach and every adds a piece or two when they pass it. My best friend has been a puzzle maniac for many years now. She tells me Ravensburger are the elite in puzzle making. She picks up a lit of her puzzles at thrift stores and garage sales, and would you believe that 99% had never been opened! She has the roll-up puzzle pad. I grew up doing puzzles with my mother, we always had one going. I have done Wysocki puzzles for years. Also love Springbok and Ravensburger brands. Barnes and Noble have a nice selection. Love the Nancy Drew one!! bitsandpieces.com. They have tons of puzzles and always a lot on sale. They also have lots of puzzle boards and accessories. I love the Nancy Drew puzzle! Puzzles are something I have trouble breaking away from once I get started on one too. After my dad retired, he put together many puzzles, most of them were of trains. I don’t know if he framed all of the puzzles that he put together, but he had several that were framed. He also put some kind of a protective coating on them. When my husband and I, and his brothers, were all living out of state, my mother-in-law would always have a puzzle or two set out for us to work on when we came home for Christmas. Those were good times and great memories. Ashley, that would be sooo perfect in a sewing room! I LOVE that idea! I know, the detail is amazing! I could sit and stare at his cat paintings all day because there is soooo much to see in each one. He had such a sense of humor! The puzzle I just finished, he put a little Santa’s elf up in the tree and he’s dangling a cookie on a stick with a long red string. At the end of the string where the cookie hangs, a bird is perched in his nest eating the cookie. It’s hilarious! How did he ever think these things up! 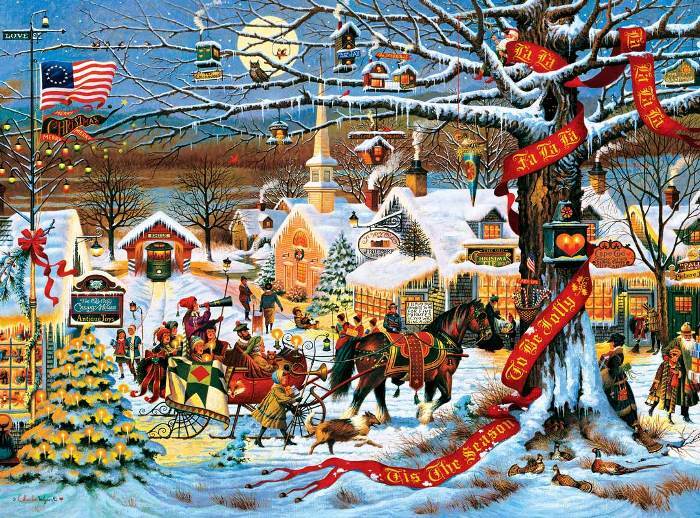 I’m so thankful people like Charles Wysocki were born…they bring us so much joy with their talents and sense of humor. Oh Susan, I always get a kick out of you……makes me smile!! We’re all kids at heart!! 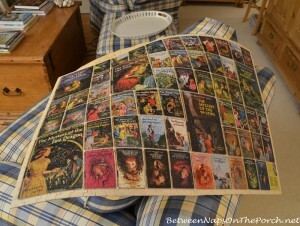 Love the Nancy Drew puzzle, I still have my collection of books from the 50’s, so I am dating myself!! Puzzles were a religion growing up, my mom would clear the dining room table for this and we would work on it here and there until she announced that she needed the table for a dinner!! Then we would scramble and work like crazy to get it done!! I carried on the tradition of that religion with my own family. We did small puzzles on a daily basis. After Thanksgiving dinner, I set up a puzzle on a large board on the coffee table in the living room and we would work it for hours. Then spent the rest of the week going back and forth to it. Like another reader mentioned, I would place the board under the sofa if company came. Many were framed and hung. I currently have a Mary Englebrit puzzle framed and hanging in the downstairs hallway. I always do a large puzzle in the winter months after Christmas has been cleared away. Always thought the slanted board thing was a good idea and knew about the roll up pad but never bought one. I have a drafting table in the basement that I used for painting on to save my neck and back, I could tack some felt to it and use it……….however, where would I put it??? I just finished a Jello puzzle, its a photo of all different Jellos on a lace tablecloth with recipe books and cards. That was a hoot!! Jello was ‘invented’ in a small town nearby. And I only buy Springbok, they are thick pieces and sturdy. Once my sister and I did a 3D puzzle of a light house with roof and walkway, that was really hard, but we had so much fun!! I have one to start now, it is a still life of a Rembrandt painting with all the shadows and light. But will have to wait till after Easter!!! This is serious stuff…. Hi Susan! Loved this post! It brought back so many memories! Growing up we did a lot of puzzles. There was always a puzzle on the folding card table in front of the fireplace during the winter. Every time we walked by we would stop to put in a piece or two. WHen I was in high school, there were a couple of puzzles that we did that I just loved so I mounted them and hung them up in my dorm room. I haven’t worked a puzzle in years but you have inspired me especially that Nancy Drew puzzle. I lov ed those books too. Have fun with your new addiction!! Hi Susan—well, I’m 74 years old and in the last few years started to do puzzles again. I only buy the large piece puzzles and ones that are 300 pieces. For me that is the most I can handle. It takes about 3 hours to finish one. I, too, can’t stop once I start. That is why I do smaller puzzles. I bought a piece of poster board that I assemble the puzzle on. 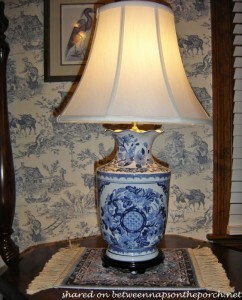 I can easily lift it up and take it off the dining room table if I need to. I love the folk art puzzles, too. I need to get some audio books so that I can combine two favorite hobbies. I love your blog. Thank you for the hours of enjoyment you give me. My brother-in-law and his family did a Christmas puzzle every year for several years as a Christmas activity leading up to Christmas. When finished they would frame it and they use the framed puzzles as part of their Christmas decorations. One of their adult son’s has started this in his home, as well. I always thought this was a cool tradition! Whatever happened to the days of a family sitting around working on a puzzle together? I was born in 67 and grew up doing this as a family. I miss those days. I curse the day you were born xbox & playstation. I wonder f I picked one up and started working on it, if my kids would stop and help me? Susan, I am not a puzzler, but my husband is addicted. He uses an Ikea drafting table for his work, which is perfect for him as you can adjust the height and can work standing up, which is what he likes to do. We framed one of his puzzles, and it hangs over his desk, but we donate the rest to our local library. We always take a photo of the finished puzzle before breaking it apart, and keep a photo album of all his finished work. I’m sure he has completed well over 50 puzzles by now. Enjoy your new hobby! Susan, I have just recently signed up for your blog. (I’m a little slow). I look forward each day to your writings. It is almost scary that I have found someone who is interested in the same things that I am. And now puzzles! I recently received a puzzle from my niece that is of my area that I live in. The middle piece of the puzzle is my home. How exciting!! I know, “I need to get a life”. Haha. What a wonderful post. I too loved Nancy Drew and the tilted puzzle board is a wonderful idea. A few years ago I was reading an article about Bill Gates, and it seems he is a puzzler also. He buys his puzzles from Stave They are one of the last companies to make hand cut wooden puzzles. The neat thing is they make custom puzzles. You can send in a photo and they will make you a puzzle. The only problem is their prices are prohibitive. Charles Wyzsocki is a favorite of mine and we have a couple of his prints plus a nice book about him. I grew up in a puzzle on the dining room table family so I have combined my love of both. 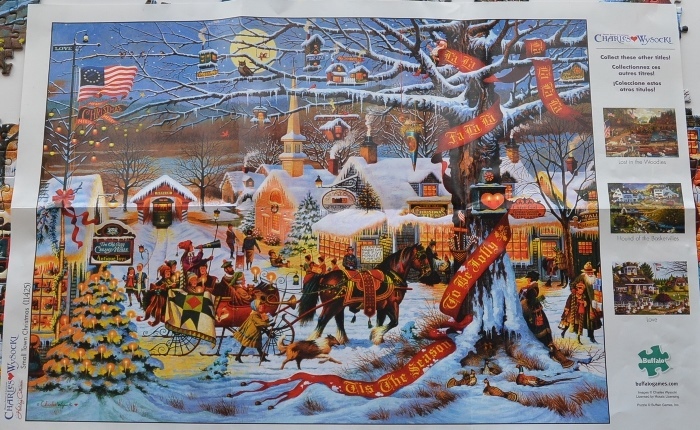 We always have a Wysocki puzzle or one that looks like his going throughout the Christmas season. Even little ones can put a piece in here and there and the older ones love it and great conversations take place around it. And it keeps people out of my kitchen 😉 Recently my mom suffered a stroke and we used puzzles as a way to challenge her during her come back. Amazing to see how hard it was right after the stroke and the rapid improvement she made working puzzles. Just the shot in the arm she needed. Susan, you are speaking my language today! I am a Charles Wysocki jigsaw puzzle junkie! I have at least 20 of his puzzles in various sizes. I also have a couple of his books. I just love his art because there is so much detail in each piece. I recently bought the black puzzle board with handles that you posted above and it’s perfect. I can’t tell you how many times I’ve started a puzzle on our dining room table and had to tear it apart because we were having guests for dinner. The puzzle board is awesome. Just wait until Halloween. Some great CW puzzles are in your future. Judy, that is awesome! He has the best sense of humor, doesn’t he? I so agree…love all the little details and each time you look at his paintings/prints, you see something new. I have enjoyed reading your blog, your decorating, book recommendations and table settings. Today really spoke to me, I have always enjoyed puzzles and have numerous Springbok puzzles. You also struck a cord with your Nancy Drew puzzle, because I too enjoyed reading the series and had many of the books. But for some reason had given my entire collection away as a young teenager. I now watch for the older editions at antique shops and flea markets. Thank you for sharing your passions with us. Thanks so much, Kathleen! I’ve also seen them on eBay so that may be a good place to look, too. My Late MIL had given me 8-10 Charles Wysocki puzzles years ago, after I was done I glued 4 of them to frame for each of the seasons. I especially loved the Halloween one. Between the puzzles slowly falling apart and then the large frame I had breaking I finally got rid of them. I love puzzles! You must go take a look at www. libertypuzzles.com. Putting together one if there beautiful wooden puzzles is sensory bliss! The feeling and heft of the wood, the visual impact of the colors – amazing. They are not cheap and definitely frame worthy. I have started a collection that I have framed. I don’t buy my frames from them because u found it too expensive, but ordered from another source online and have plexi glass on front and back because the back of the puzzle is just as amazing as the front as you can see all of the different shapes! My last puzzle was one of a London scene and in it are whimsy shapes of Big Ben, Tower of London, etc. They really are amazing. I’ve tried artifact puzzles as well, but prefer the feeling of the liberty puzzles. Sounds amazing, Samantha! I will check those out for sure. Where do you order your frames? I’ve been trying to figure out the best way to frame them. Welcome to the “Addiction of puzzles”! I’ve been doing them for more years than I care to remember….mostly a winter hobby, even my grandchildren are hooked. It’s a great way to spend time with the kids….they tend to tell Grandma things they normally wouldn’t! ….When we are done with the puzzles we donate them to the Senior homes or the Veterans’ Hospital…. Thanks, Lois! What a great idea for the puzzles once you’ve enjoyed them. Susan, I only recently discovered your blog and have been enjoying it immensely! When my 4 kids were very small, I would unwind at night after I put them to bed by working on a jigsaw puzzle. Then I forgot about them for years until last fall, when I shattered 3 bones in my foot and was in a cast for 14 weeks. 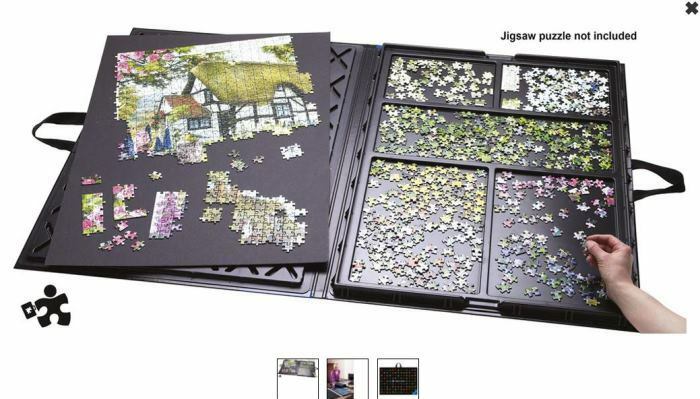 The lack of mobility reignited my enjoyment of jigsaw puzzles and like you, I discovered ebay was a great source for them. Even though I’m really particular about the subject matter, I was still able to find some great lots at good prices. In 14 weeks, I completed 17 puzzles. The 18th is incomplete, in a cardboard puzzle board/keeper under my sofa, where I last worked on it the day before getting my cast off a couple months ago. This is a great reminder to at least go finish it. 🙂 They really are addicting! I have many happy memories of doing jigsaws with family and friends, especially during summer vacations in Estes Park, Colorado. We would sit for hours on the cabin porch, with gentle rain and the wonderful aroma of horses and mountain grass to complete the scenario. Now that I have been reminded of those puzzles, I plan to go to the puzzle box in the games closet and bring them out to do each evening on the patio after gardening chores are done. Happy days are here again! P.S: The company can be found online. Their service is excellent and pricing is reasonable plus for an additional cost they offer a tin storage box in place of a standard cardboard one. oh I love jigsaw puzzles! I do them in the winter when I cant get on my garden. I had no idea there were such lovely ones out there, I shall have to hunt them out. looking at the covers for the nancy drew books reminds me of one of my favourite places to visit. the Astley Bookfarm, near Nuneaton,near where I live in England. They have thousands of second hand books,and a fabulous coffee shop. you can spend the whole days there,and they have childrens bookcovers underneath the counter like a huge poster! and they have the walls of the loo covered in old book titles too;i.e. Agatha Christie.I was thinking of doing something similar,but cant bear to take the covers of books! they have a “10 bob” barn too, (50p in new money) can you imagine how many books I come back with?? Believe it or not, Walmart carries Wysocki puzzles in great supply. on rainy days, blizzard days, etc. I didn’t know that…will have to look when I’m in there next time. Thanks, Martha! I have been doing puzzles since I was a kid.. It was always a tradition to clean up and put away the Christmas decorations and then out came a new puzzle on the dinning room table to chase away the “snowed in” blues. I still carry on this tradition. Enjoy your new “addiction” !!! How long ago did you purchase this? I’ve been looking for something exactly like this but do not see it on the Herrschners website. Thanks! I did a Jackson Pollok painting puzzle and framed it. I make puzzle and Mod Podge them and frame them. I’m a Disney fanatic so I saw that Thomas Kinkade makes puzzles of Disney characters in beautiful landscapes. So far I’ve done just the Beauty & the Beast and then framed it. I still have Cinderella and The Little Mermaid. I actually have one more but forget which Princess it is. I got them on AMAZON. He did an AMAZING job with them. I have a person on a Disney blog I follow who did the same B&B by Thomas Kinkade but it was all crosstitch and it took her 3 years to finish it. Anyway I am looking into the table you got. I know this thread is old and hope you even get this. I am hoping you have some insight on the table for me….Sandi R.
Those puzzlers sounds so beautiful! I think I have a few Disney puzzles tucked away that I purchased a while back. I found that doing a puzzle without looking at the picture increases the fun and enjoyment. I have a friend who put together that 18000 piece puzzle AND built a frame for it. It took him 4 months & 6 days to build the puzzle & 2 months to build the frame. The finished product is Amazing!